Back in the Keys, I got the headers installed so I got around to finishing some other Barth projects. I started this one last summer. I got sick of the old 7kW Kohler klanker. Loud, heavy, vibrates and guzzles gas, bigger than I'll ever need. I have always liked Honda generators for the opposite reasons. 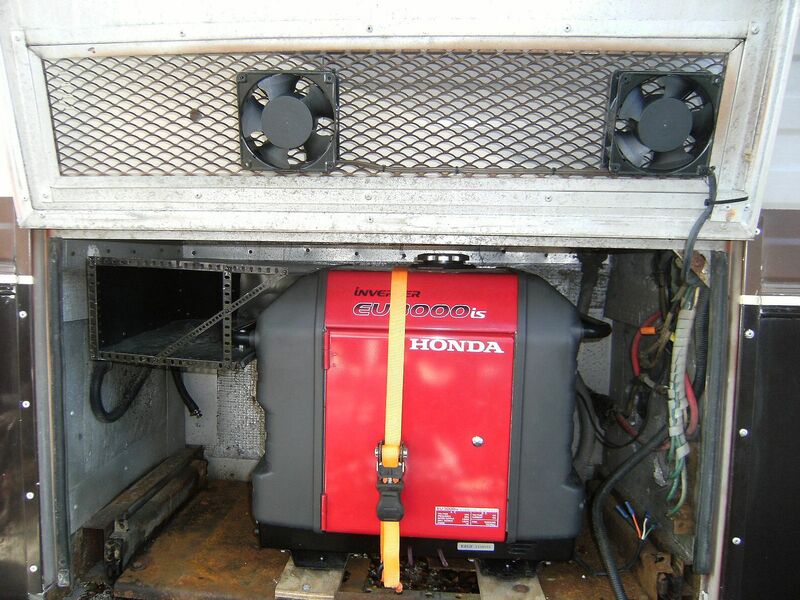 Unfortunately, Honda no longer makes the water cooled 4kW RV generators they used to. 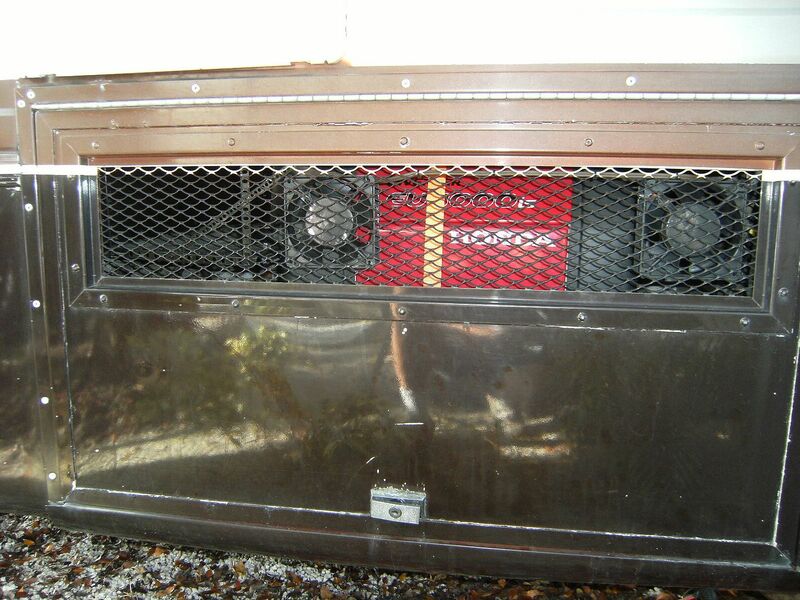 I decided to take a shot at modifying and installing an air cooled 3000 watt inverter generator. I wanted to keep it portable if possible so I can use it for other jobs. It is one of the most quiet generators you can find. 1. The Honda weighs 148 lbs including its own 12v starting battery. (The Kohler is 350 lbs) It fits easily into the compartment. I made a few minor changes to the platform and strapped it in. I put 2 wooden mounts with recesses for the rubber feet under the generator. 2. 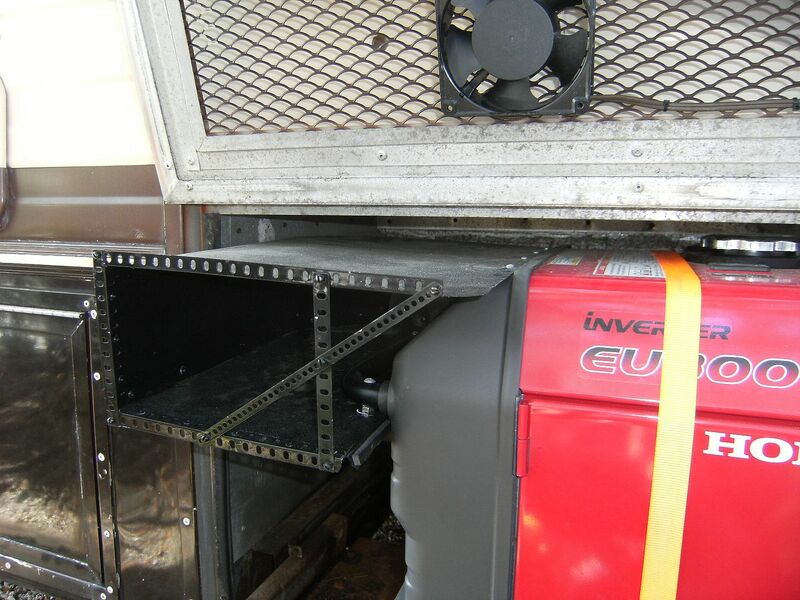 This generator pulls cooling air from below and exhausts it out the left side. Unfortunately, the exhaust is combined internally with the cooling air so I couldn't run a discrete exhaust system. I built a sheet metal plenum which attaches to the left side and directs the air out the existing grate in the generator compartment door. It is lightweight and easily removable if I use the generator somewhere else. In addition, I wired two 110v muffin fans and attached them to the grate (blowing out) for additional scavenging and cooling air. 3. 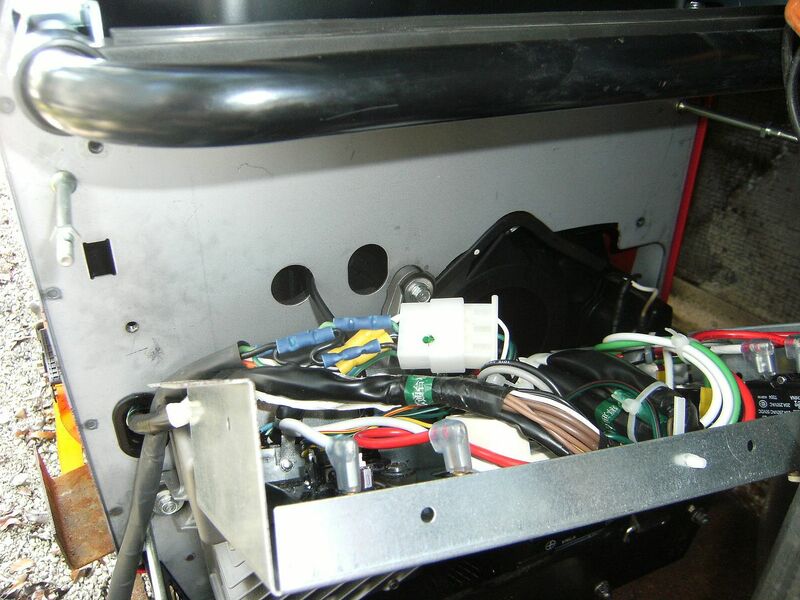 I removed the side covering the control panel and intercepted the wires to the ignition switch. I brought them out the side so I can attach them to the remote harness from the Kohler. They will be connected to the harness with a detachable plug to retain portability. The Honda wires have different functions so I have to rewire the Kohler dash panel as well. I still have to finish the dash control hookup. So far this works really well. The 3000 will run both ACs. It will run one AC on the "eco-throttle" setting, which allows the Honda to run at near idle when the AC is not cycling the compressor. There are only 2 details left. 1. The Honda has its own gas tank. I considered plumbing the gas line from the Kohler to the Honda but it would make it less portable. Instead I think I will wire in a small fuel pump to manually fill the Honda tank with a short hose. 2. The Honda has a manual cable style choke. I will not be able to cold start it from inside until I rig a choke system. I could run a cable but that would compromise portability so I think I'll rig an electric system with a small solenoid to pull the choke in. Vibration is nil and it is so quiet you can barely hear it running inside the coach! With engine or AC running you can't hear it at all. I have run it down the road and the AC is great. Fuel consumption is very low, the Kohler used as much fuel at idle as the Honda does wide open! So far this is a much better generator setup than before. The 3000EU is actually quieter (outside) than my EV4020 liquid-cooled RV genset. Inside, mine's ~16db quieter than the Kohler Klunker; the only way I can tell it's running on the road is the pilot light. Fuel consumption is ~35% of the Kohler LPG. You'll be very happy you made the switch! You will find this handy. I have always used the genset pump for filling mowers, trimmers, hole diggers, etc. I even had a timer for shutting it when it had filled a Jerry can. How do you manage the connections back to the coach power system? Plug in shore cord? Transfer switch? Any advice on Champion brand generators? I wired the appropriate plug (Leviton L0530P) to the existing coach wires and use it like a shore power cord. I saw that but they want about $180 for the kit. Since I already had the Kohler wires I balked but it would be nice to have the choke solenoid... I don't suppose it's available separately. Great Job Steve, that is a perfect replacement solution for the ole generator. That is on my project list. My ole Onan generator needs to be replaced for all the reasons you pointed out. Having the Honda for other uses is a big bonus. I have a smaller Honda EU2000 that we use occasionally at work, people have borrowed it for remote RV camping, it'll run anything that a small RV has including the AC unit. Honda Generators are the best out there for portability. The 2000 Honda is a great, quiet, portable generator. One of my friends has one, it helped me decide to go that route. The 3000 has electric start, main reason I went for that size. 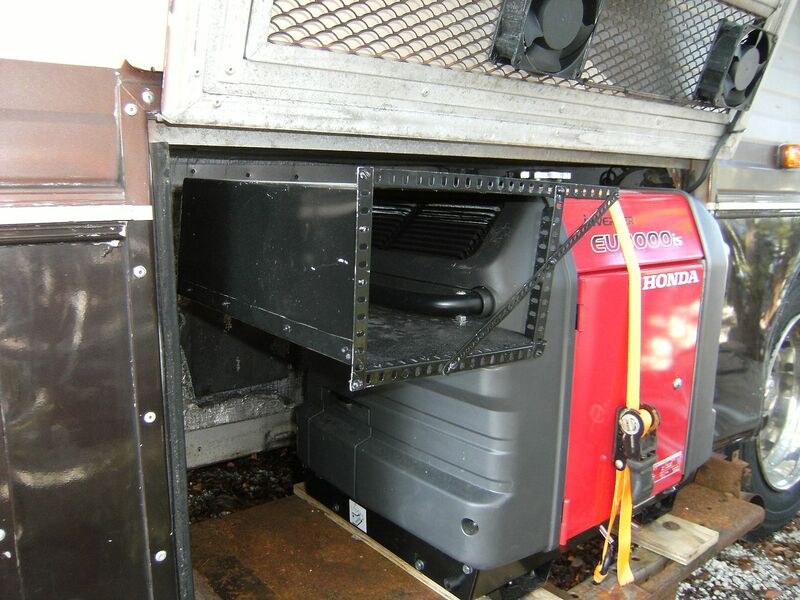 I would definitely recommend the Honda inverter generators, run quiet and strong. ....Remote start a Honda Generator?? Very sophisticated remote internet controller. Also pricey! They removed the gas tank, disconnected the ignition switch and removed the choke cable so the generator is no longer portable or capable of starting with its own switch. These are costly concessions in my world. The door lock solenoid for the electric choke looks like a good option for me. I would just switch it on with a momentary switch while cranking. It may be a bit tight fit when the tank is still there. I will report any further changes! If there's a hobby shop nearby, get a Turtle model railroad switch motor ~$20. It has a lever for connecting a pushrod and 2 positions. My Onan generator sat for a couple months without being run, now it won't start. My mechanic says it needs a new carburetor (2nd time!) and control panel, to the tune of $1,000. Came across this thread and again am reminded that some of you (e.g. Steve VW) are crazy-town mechanically talented. Not I. 1. Is it really "expected" that these carburetors will stop working if they sit for a couple months? Bear in mind the carb was only a year old. 2. Other than the job on this thread, which would take me, oh, 15 YEARS to complete, are there any recommendations for a generator with similar properties as the Honda, but without all the retrofit shenanigans? There is no reason a carb should be shot in one year. However, with today's gasoline sitting in warm climes for a year it could be full of crud. Given mechanics charges nowdays it might be cheaper to replace rather than clean/rebuild. The Onan modules are high priced junk IMHO but they are the only suppliers I know of. Not impressed with Onan as a company. BillyT from this site runs an RV repair place. He is the largest Onan repair shop in the central south. See if you can PM or call him. He will give you straight choices. 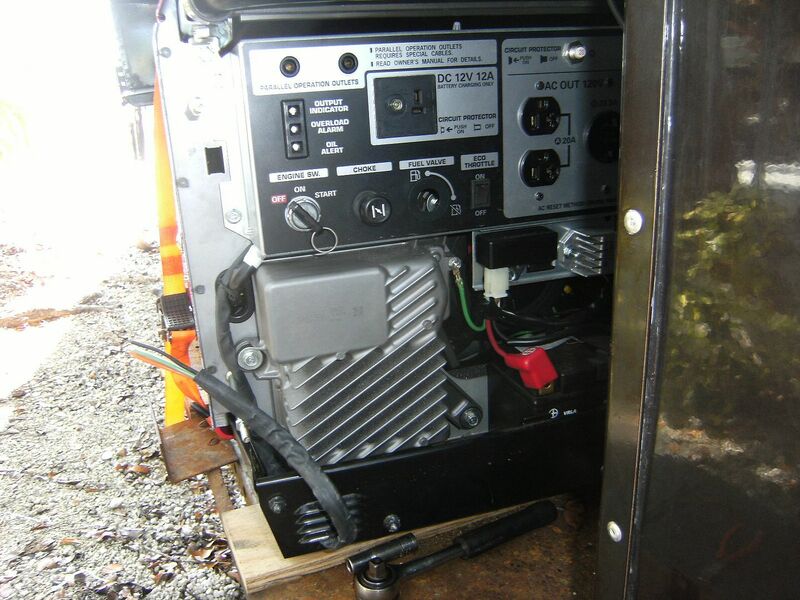 Check for used generators, esp from RV salvage yards. Might get lucky. Quinn, my Onan sat for a few years, would not start, I disconnected the air filter shot a bit of starting fluid in the carburetor intake as I was turning it over. Other than a bunch of oil leaks I had to fix it now runs like a champ. If the P30 fuel tank is less than 25% full the generator will not get any gas. Good luck!